A great little tarot spread in honor of the Mabon Sabbat and celebration of the autumn equinox. 1, 2, 3 – Leaves. These are all of our acquisitions over the summer period. It’s time to count them and value them. 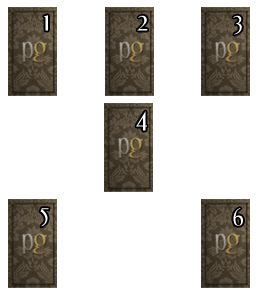 Three cards are chosen because there are three months of summer. 4 – Bucket. This is what we should create using the given resources. Not a form, but a task until the coming of Samhain Sabbat. 5 – Balance of the day. The necessary active actions and sacrifices that are needed in order to realize our goals in life. 6 – Balance of the night. The necessary internal changes, emotions and feelings which are needed in order to implement our goals.